One day in the 1980's, when I studied woodworking with Maurice Fraser, I came to class for what was the first of a sequence of classes on chopping and fitting mortises and tenons. "Mortice" with a "C" being the English spelling and "mortise" with a "S" being the American spelling. Maurice wanted us to use the correct tool for chopping a mortise. Which was an English Mortise Chisel. Not a sash mortise chisel, or a socketed mortise chisel, or millwright's chisel, or a registered chisel. An English Mortise Chisel. They were unlike any other chisels I had ever seen. The oval handles were comfortable, the chisel was built like a tank and could stand tons of abuse, the body of the chisel was trapezoidal in section so that they were easy to free in the mortise, they were available in 1/16" increments from 1/8" wide to 5/8" (actually more but the larger sizes are rare and not much used in cabinetry), and most important they were no longer made. 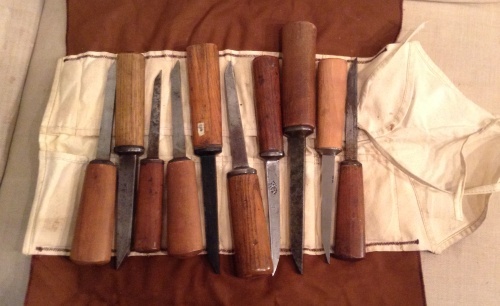 Like many students I assembled my set of mortise chisels (see above) over a period of several years via mail order and auction from various English tool dealers. Around 2002 or so, now involved professionally in ironmongery, Ray Iles and his brother Barry came to pay a visit. As the last generation of Sheffield apprentice trained edge tool makers they have forgotten considerably more on the subject of tools than I have ever known and I don't miss any chance to pick their brains. "How about" I said as we were sitting in my living room thinking about dinner, "Making me some mortise chisels?". Ray looked at me with that look usually reserved for professors just before they decide to inform junior, who showed some promise earlier in the semester, that he will probably have to repeat the year. "Seriously" I said "I can sell them, we can't get real ones over here!" After gently telling me that nobody had manufactured mortise chisels since at least the war and even before the war it might have been old stock, Ray, who loves a challenge, thought he would give it some thought. A few discussions and about a year later a small box showed up on my doorstop with a sample. Mortise chisels aren't easy to make. It's a lot of steel and the huge bolster started out as a problem. I asked Ray to make them out of D2 instead of regular steel because the edge would last forever and you didn't really need the sharpness of a paring chisel. This presented another set of problems which Ray had to solve, and Ray had to resurrect some of the old machinery he had to make oval handles. When we finally released the mortise chisels into the American market it was a revelation to many of the people who used them. It fundamentally changed the market, and Ray has been struggling to keep the supply up ever since. Aside from a D2 cutting edge the only substantial difference between Ray's Mortise chisels, and mortise chisels of the early 19th century is the under the handle Ray uses a square tang, rather than a tapered tang. 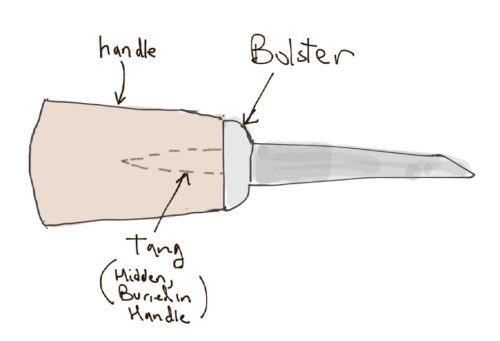 The tang being a spike of metal that sticks out of the back of the chisel so that you can attach a handle(see picture). Ray uses modern fixtures and specialized grinding machines to grind instead of doing it all by hand on a big wheel. The funny part about it, and the key that made Ray pretty sure he was going about it the right way is that he can see grinding marks on the old ones in the same places as on his. It might be fun to take a close look at early 19th century mortise chisels and explore their engineering. Lots of this information applies to any handled edge tool not just mortise chisels, and we will end the series with instructions on how to handle a new chisel or replace the handle on any old chisel - it's a pretty simple task, and requires no special tools. Note: At this moment we are out of some of the more popular sizes of mortise chisel. You can place an order anytime, Ray is working hard to make more for us and we should have them reasonably soon. Note: Ray, Barry, and Tony Iles are all the sons of Ashley Iles, founder of Ashley Iles Edge Tools Ltd. the famous edge tool makers whose tools we stock. Ray left the company to start his own firm and his firm makes our mortise chisels and some other tools. Barry and Tony own and manage Ashely Iles, and they make a wide range of edge tools with a special focus on carving tools and turning tools. They are a very close family and Ray does work for Ashley Iles and vise versa. For a few short videos at their factories (along with a visit to Clico) click here. Click here for Part 2 "What The Catalogs Tell Us". Click here for Part 3 - The Body of The Tool. Click here for Part 4 - Chisel handles. Click here for Part 5 - How to Handle a Chisel. Great that the Iles are making these and that you are promoting them. There are some other differences - the main one being that most of the nineteenth century examples and many up to about 1940 are made with a laminated or laid carbon steel edge on a body of wrought iron or, less commonly, blister steel or mild steel - the wrought iron also makes it easier to weld on the bolster (which is usually forged from the billet in lighter tanged chisels). Many makers sold two ranges of these, heavier (deeper, longer and with a larger and finer bolster) or standard (still much heavier than most mortice chisels) - so there is still plenty to explore after getting a modern set by Iles. A further observation - they were usually supplied new with beech handles, but almost all replacement handles seem to be ash - why (I have only seen ash as an option in one catalogue out of many)? great chisels -- old or new. Thanks for the comment, just wait until the rest of the series - coming in the next week or so. More information is coming, some i sync with you, some not. Saw these, studied the historical and modern use potential, bought 5 from here in assorted sizes and really enjoy using these on regular basis. These are the real deal!! !